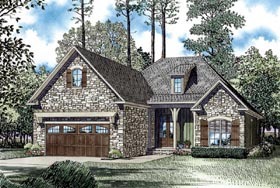 This charming European plan maximizes space while providing an open floor plan. The great room features a fireplace and a vaulted ceiling and is open to the dining room and kitchen. The kitchen features an eat-at island bar and plenty of counter space. The master suite has a boxed a ceiling and dual vanities, a whirlpool tub/shower and 2 walk-in closets. Bedrooms 2 and 3 are located on the opposite side of the house with the front bedroom having a walk-in closet. Over the garage is a large optional bonus room, perfect for a home theater or game room. Answer: The Sq. Ft went up by 82 for the basement stairs and the laundry room got moved to the basement.